The roots of PETree are deep in the ground .- four years back. In 2011 I went to study at ETH Zurich. During my stay there I was teaching Experimental studio: „architecture from garbage“ together with Henri Achten in Prague. It was a remote lecture and seminar for students in Prague as well as in Zurich. Thanks to prof Schmitt I met Louis Palmer, an adventurous project manager, who asked us to design and build a tower out of 150 000 PET bottles for the Zurifascht festival. We immediatelly accepted the challenge, but we were unable to fulfill the requirements. The results of the first semester were a catastrophy. Unreal. Next semester I arranged a workshop called PETower, where 15 students tried to design a tower made of 150 000 PET bottles. We ended up with beautiful real projects, but the investor: the COOP company stepped back and we ounly built a working prototype 1:10 at the Zurifascht event in summer 2013. This time we invented MOSTICK, a bar made of PET bottles pressed by CO2. Next year, I was almost done with the bottles, ready for next task, but I won a grant for writing a book about architecture from PET bottles. And I also wanted to publish the nice projects of PETowers. I started searching for examples in the world and I found so many!!! This caused publishing a book called 150 000 PET bottles in May 2014. For this book I didnt not have enough money, so I found Mattoni to sponsor it. The chief of Mattoni, mr. Pasquale, even read the book and invited our team to cooperate on research on recycling of PET in architecture. He asked us to develop a bottle-brick. In July, PET-MAT was established, the research team at Molab FA CTU Prague. The duties of the team is not only to research the reuse of PET, but to bring the knowledge of the material into education, to raise social awareness about plastic and its recycling. 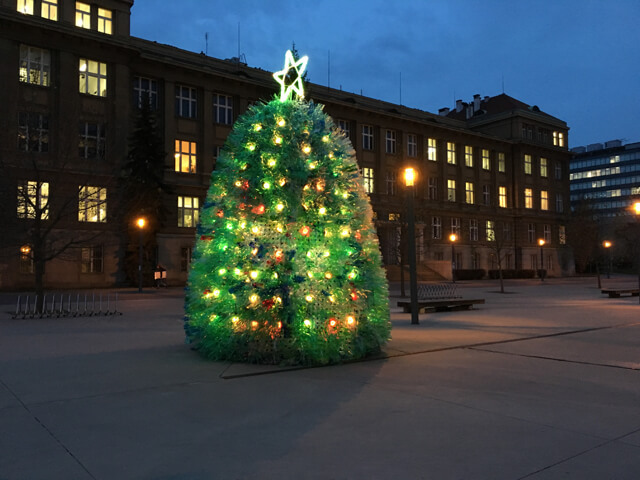 I thought building a christmas tree would be a good idea, as I published many examples in the next – czech edition of the book: The phenomenon of architecture from PET bottles in May 2015. We actually talked about it from the beginning, since the Tree in Lithuania (2013) was well known and it was, according to my ideals, a dream project for Experimental studio. Finally in Summer 2015 it was decided: let us open next Experimental design studio Achten-Nováková in cooperation with PET-MAT (Nováková-Prokop), other faculties and high schools and design a tree together with the students. And this is the four year long background of PETree.